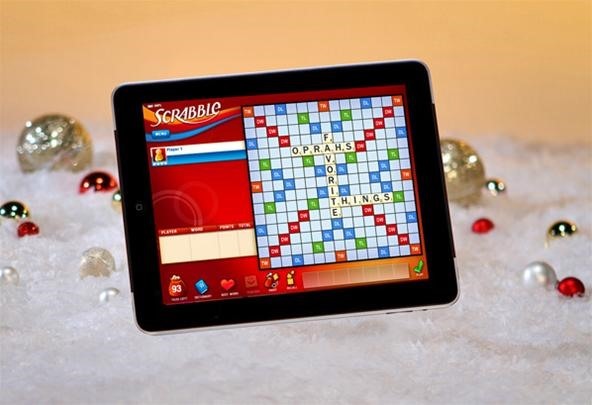 The iPad SCRABBLE App by Electronic Arts had made it onto Oprah's Ultimate Favorite Things of 2010, right next to the Apple iPad. It was a marriage made in heaven: Oprah's favorite new device met her all-time obsession—Scrabble! Games can be played with friends or alone—Oprah loves to play while she works out. "I can get at least two Scrabble games while I work out on my treadmill," Oprah says. "I actually went an hour and 20 minutes the other day and beat the computer with a score of 384." And thanks to Oprah, EA Mobile has decided to give away 2,000 FREE download codes for SCRABBLE Apps on devices running Apple's iOS, i.e. the iPhone, iPod Touch and iPad. The madness started at 3PM (PT) yesterday, November 22, 2010, with EA giving 1,000 away each on Facebook and Twitter. 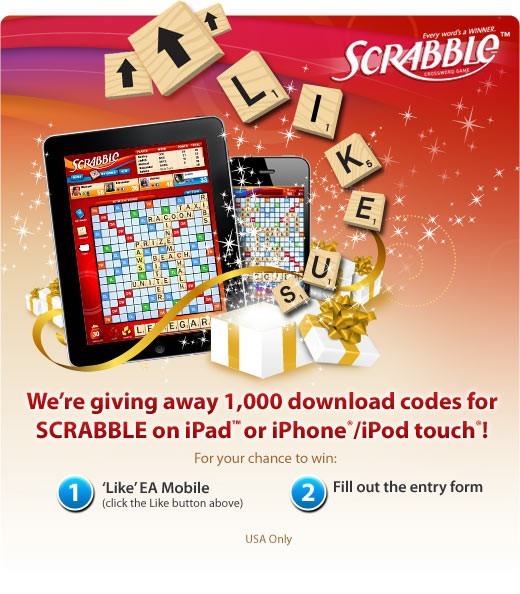 To snag a copy of SCRABBLE, you must "Like" EA Mobile on Facebook or follow EA Mobile on Twitter. To enter via Facebook, visit EA's Facebook page, click the "Like" button for EA Mobile, and then fill out a short entry form. Exactly 1,000 entrants will be chosen at random to receive a free download code for SCRABBLE. The promotion ends today, November 23, 2010, at 3PM (PT). US residents only. To enter via Twitter, you need to follow EA Mobile and then re-tweet this tweet. The first 1,000 to re-tweet and follow will win. The promotion lasts for 24 hours or until the codes run out. US residents only. So, HURRY UP before you lose out on your chance for a FREE SCRABBLE GAME! Yeah... it's slim. Probably better to just fork out the 5 bucks.